….the player must not ….touch the ground in the hazard or water in the water hazard with his hand or a club. After reviewing television footage and consulting rules officials who were standing next to the bunker he was cleared of any infringement. This favourable ruling meant that C Muniyappa held on to a one stroke lead going into the final round. He managed to hold his nerve and shot a 71 to finish the four rounds as joint leader with South Korea's Lee Sung. He then had to return to the 18th hole that had caused him such a nervous wait the day before, to commence the play-off. 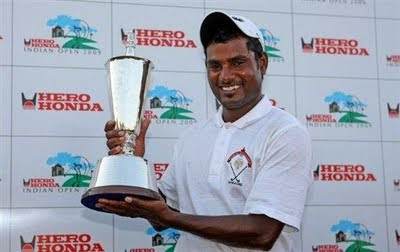 A few minutes later he calmly slotted a 10ft birdie putt to win the Indian Open, transforming the life of a player who, like most Indian golfers, comes from a humble background. Most golfers know that they cannot ground their club in a bunker, but some readers might not have realised that the same Rule applies when your ball lies in a water hazard. Don’t make the mistake of casually washing your club in the water before you make your stroke from the hazard, or touching the water with your backswing as you play your ball lying close to the water’s edge. Both of these incur the same penalty as touching the sand or grounding a club in a sand bunker.